As a parent, you might dream of a bright future of him/her and investment is a vital step in doing so. Parents generally focusing on the major goals for their child such as marriage, education and a comfortable lifestyle as well. All these goals have different requirements, so it is essential to think about each separately and find the needful investment plan that can suit these requirements as well. For a bright future of your child, it is vital to think about the investment proposals as soon as possible. Today the cost of education is so high that most of the parents are unable to provide their children the level of education they want. If this is the situation today, then you can imagine what would be the scenario in the future when the inflation will be much higher. A child future plan is designed to meet your child's future financial needs. Child investment plans are essential to meet the needs of providing the child with the best of education and to make sure that the cash flows are there at every crucial stage of your child's growth. For instance, if your child is 4 years old and you plan to provide him higher studies after say, 15 years which costs Rs. 20 lakh today, then you can imagine how much would it cost after 15 years. Therefore, it become necessary to invest for your child today in order to have funds available at the time when the actual need arise. There are two types of Child policies in India- Child ULIPs & Child Endowment Plan. The plan you should select is usually dependent on the amount of coverage you want and the tenure of the policy. 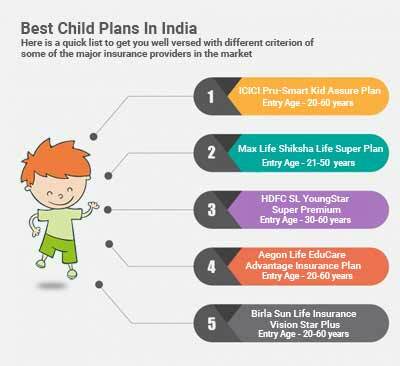 PolicyX.com understands your concern as a parent and thus provides you with best insurance plans from leading providers such as Max Life, HDFC Life, Bajaj Allianz, Reliance, etc. You can compare and choose the best child coverage as per your requirement on our portal within minutes. 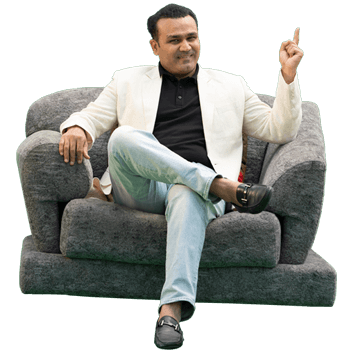 Max Life Shiksha Life Super Plan 21-50 years 65 years INR 25000 Minimum- INR 50,000/-. This is where child plans can help you in looking after your infant's education or marriage expenses in the years to come. All you have to do is make investment of a part of your income in a child plan to ensure you have got enough funds in the times ahead whilst your child would require it the most. So the day your child desires to pursue a degree in architecture from abroad or a film-making course in a reputed institute, you're in a comfortable position to ensure his/her fees. And even if something unlucky happens to you, you are confident that the needs of your childrenare taken care of when you aren't around. An Indian investor is continuously unnerved with market volatility and lacks the necessary discipline to create wealth over the long term. It's pretty likely for the person to set cash in a mutual fund for his infant. However, a child plan will make the parent retain making an investment, for the simple reason of making sure that he saves sufficiently for the kid. You could stop paying the premium after five years, however, specialists say this should be a tactical ploy to keep away from a cash crunch, not a strategic flow to lessen one's investment. Ensures your child's future needs and allows you to plan in a better way to stabilize your future financially. Almost all major insurance companies offer child plans as an important insurance product in their portfolio. These plans may differ on various parameters depending on individual needs and priorities and come with a customisation feature. Because the call shows, those child plans provide the buyer a flexibility on premium payments, as in keeping with the benefit. One pays premiums yearly, half of-every year or quarterly. Right here, the insured (figure) pays a lump sum quantity as a single premium for the entire term of the plan and be relieved from the duty of remembering payment dates. There may be no hassle of arranging the finances for premium payments throughout one-of-a-kind ranges of life. Some insurance companies additionally provide appealing discounts or decrease premium on such plans as they get the lump sum budget. LIPs (Unit linked Plans) divide the premium received among debt and equity based totally investments for optimum returns. Child ULIPS make investments a small component in debt primarily based merchandise whilst essential amount is invested in equity products in order that the returns can be maximised for the kid over a long term. This includes higher risk, however then the chance of earning higher returns is also excessive! Also, the policyholder can determine how the premium may be invested and in what form of merchandise so the insured has a manage over his investments. In these plans, the cash is invested in debt-based investment and the insurance issuer comes to a decision which products to put money into. Considering that it's debt primarily based funding, the returns are not that high, but it's should be in consideration to be secure compared to equity based investments and guarantee minimum returns. There are many benefits that you will get after buying a plan. Mentioned below are the major benefits that you will get along with a best plan. Basically life insurance for children provides you the flexibility to choose according to your economic status and superficial monetary goals. The rate of premium can also be settled as per your interest. At the time of maturity, the sum assured amount and a definite partaking sum will be paid to the parent or guardian. In the case of early death of the policy holder, the child is allowed to receive all the benefits of the plan (if the rider is attached to the policy). Yes, it is true that a child policy in India provides tax benefit that can be availed on maturity/death claim profits under Section 10 (10D) and assumption from income for the expenses of premium under Sec. 80(C). Riders provide a more secure and financially stable life to your ward. It is advisable to select a rider, according to your requirements. Don't think about the extra premium that you are paying for riders, consider the benefits that you will get and make your policy more powerful. Here are some main features that you must look for hen you are purchasing a child policy for your ward's future. Now the question that arises is that which is the best child policy for you, but there's no right answer of this question as the child policy depends upon the requirement of the policy holder. You should cautiously compare and then purchase the child policy that suits your need and which meets the future needs of your ward. Many people ask how a child insurance plan really works? Will they be able to provide assistance on time? Will they help in dealing with all the upcoming expenses and so on. The basic step is that you have to invest an amount on the monthly basis for maximum 25 years. It will help you in saving a lot of money for your child with good returns that will help you in dealing with the child's education expense and later on, marriage expense as well. A corpus buildup over the years to take care of child's life No money, no resources. You are putting a big question on your child's life. A little premium is charged to buy this rider, under which, the child receives additional rider sum assured if parent dies in an accident. If the parent suffers permanent or partial disability due to an accident, the child becomes eligible to receive a lump sum amount, which is equivalent to the rider sum assured. Again, little extra premium is to be paid for this additional benefit. If the parent suffers from a critical disease like Heart Attack, Cancer, Coronary Artery By-pass Graft Surgery (CABG), Stroke, and Kidney failure, child receives an additional rider sum assured. A small to large premium is charged, based on the age of the parent. Permanent disability of the parent due to an accident. Parent being diagnosed with any of the critical illnesses specified in the policy. A small premium is charged to get the benefits of this rider. Make sure to insure your life also. It is beneficial to buy a plan which has a built in clause premium waiver for the future. This would guarantee that the plan continues if you are not there to take care of it and your child would be able to receive assured sum amount at maturity. It is advisable for you to check the company's record before purchasing child insurance. Buy the plan in the parent's name instead of a child, since the child anyway has no dependants. But if you are planning to buy the best one in the child's name, then ensure that it has a built-in feature of premium waiver in case of death of the parent. This will protect your child from the burden of heavy premium payments and he will continue to reap the benefits of the plan. Also do a check out the tax benefits of the plan.It is an incredible financial investment planning tool for child education / marriage / unforeseen expenses etc. It assists in meeting the child's monetary needs and provides safety in the form of a life insurance plan. 1. What is Child Education Plan? ICICI Bank presents "Child Education Plan", a unique way to save for your child's future. To fulfill your child's dream & aspirations, begin by making small investments in a Recurring Deposit for a short tenure and receive regular payouts for the rest of the tenure in your child's "Youngstar Savings Account". 2. Can I take a loan on the Child Education Plan? 3. Can I set up a Standing Instruction for installment payment in the Child Education Plan? Yes, you can set up standing instructions through your ICICI Bank Account for paying the installments of the Child Education Plan in the Investment Phase. 4. What is the minimum installment amount for Child Education Plan? 5. How will the interest rate be assigned to Child Education Plan? Child Education Plan will earn prevailing fixed deposit interest rates for the entire deposit period, i.e. same rate of interest in Investment and Benefit Phases. The rate of interest applied will be as per the total tenure of Child Education Plan, including both Investment and Benefit Phases. 5. Can I partially withdraw from the Child Education Plan?